As many of you know by now, I am a sucker for any book that gets compared to another book that I already enjoyed. Which I KNOW is unfair, because if every novel that was "the next Gone Girl" was REALLY the next Gone Girl, there would be about eleventy billion Gone Girls. But I am nothing if not consistent. 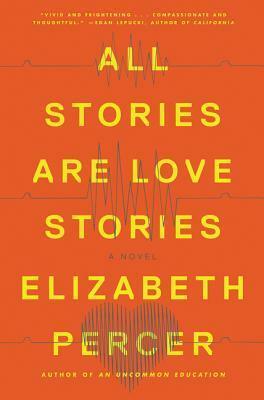 All Stories Are Love Stories has drawn some comparison to Station Eleven, so really I did not need to know more--sign me up, I wanna read it. I quickly realized that (as with most book jacket comparisons) the similarities between All Stories Are Love Stories and Station Eleven end pretty quickly. 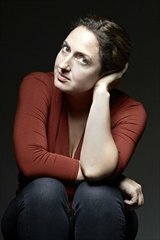 They both have a bit of a post-apocalyptic feel to them: Station Eleven's is literal, as the civilized world ends after a deadly virus, but in All Stories Are Love Stories, the feeling is figurative, as the characters struggle through death and disaster after an earthquake ("the big one") hits San Francisco. Beyond that comparison, I think it's safe to say that Elizabeth Percer's new novel has a life of its own. This novel is interesting because it feels like two separate stories (and I'm not referring to the 2 different primary plot lines: Max & Vashti vs. Gene). There's the disaster story of the earthquake, which is formidable and striking in its own right. But then, against this fiery backdrop, you also have the more intricate human stories within it: the love stories, if you will. Max and Vashti's relationship is definitely the most captivating, as they reunite after a sad separation that unravels slowly for the reader. (Admittedly, sometimes too slowly--I liked their connection, but often wondered why the details of their history together had to be pulled out so painstakingly.) But there's also Gene, fighting his way back to his husband Franklin; Ellen, a TV reporter who is trying to decide exactly how much she loves her job; and a group of mismatched survivors trapped in a downtown theater, trying to navigate each other as they also navigate a way out. None of these "love" stories would be as impactful without the larger earthquake story behind them. This disastrous scenario creates a sort of do-or-die situation that forces each character to show their true self, and address the nitty-gritty details of their relationships. Sounds pretty unique, right? It most certainly is. However, I have to admit that this probably won't be a novel that sticks with me for very long. I like the unusual blend of characters that it brings together, and the earthquake situation is written with a degree of detail that shows a fair amount of research on Percer's part. That said, the mental narratives of some of the characters were a bit too drawn out for me at times. I don't mind an introspective novel, but when there's constant musing without much forward motion, I start to drift, and that was the case here. My final verdict was a 3-star Goodreads review: a solid, distinctive novel with a lot of intriguing detail, but a bit too run-on at times to make it stand out in for me. However, if more reflective, lingering prose is your thing, this may still be up your alley. Want to find out more? Check out the other blogs on this book tour HERE. And connect with Elizabeth Percer via her website and Facebook. Interesting, especially about the run-on part. I tend to get annoyed with that kind of prose, but like you said, some readers love that! Yes, this is definitely one of those books that, even though it wasn't my favorite, I could see it being a huge hit with other readers. This caught my eye at the library, so I'm glad to see your review! The way the disaster narrative forces people to show their true selves sounds really interesting, but I can see how a lack of forward motion would be frustrating. The cover is very eye catching! It sounds like a lot of people are picking it up when they notice it on display. I have this one sitting on my floor...in hard copy, which is always tough for me. I think if you'd raved about it, I would've sucked it up and tried the hard copy, but probably not since you seem so-so about it. Ah, that's me with e-book. I'll pick up anything in print, but e-book has to be particularly compelling! Sounds intriguing! But I was hoping you would have loved it. I also picked this up, at least in part, because of the comparison to Station Eleven and I also found it to be a three star read. I didn't mind the introspection, but I really hated the ending and that knocked a star off for me. Yes, endings are a total make-or-break for me. This one wasn't particularly off-putting for me, but I do agree it could have been better.